A non-noble Ni-MoO3/CN@SBA-15 catalyst exhibits unprecedented catalytic activity and chemoselectivity for the reduction of nitroarenes to anilines in ethanol with hydrazine hydrate. A procedure for the synthesis of tetrazines from gem-difluoroalkenes under aerobic conditions has been developed. Oxidative lactonization of meso-3-methyl-1,5-pentanediol to (S)-4-methyltetrahydro-2H-pyran-2-one using horse liver alcohol dehydrogenase (HLADH) and photocatalytic, aerobic regeneration of NAD+. 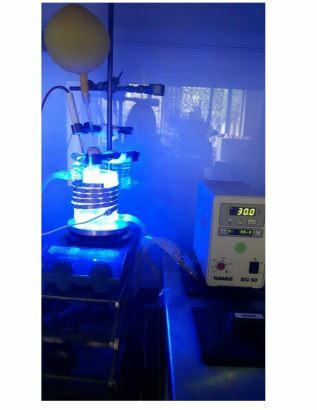 The photocatalytic oxidation of NADH using a flavin photocatalyst and a simple blue LED light source is reported. The photocatalytic oxidation of NADH using a flavin photocatalyst and a simple blue LED light source is reported. This in situ NAD+ regeneration system can be used to promote biocatalytic, enantioselective oxidation reactions. Compared to the traditional use of white light bulbs this method enables very significant reductions in energy consumption and CO2 emission. Synthesis of (S)-4-methyltetrahydro-2H-pyran-2-one catalyzed by HLADH The synthesis of (S)-4-methyltetrahydro-2H-pyran-2-one was performed as previously reported by Kara et al. (2013). For this, a stock of meso-3-methyl-1,5-pentanediol (0.5 M), NAD+ stock (25 mM), acetosyringone stock (2 mM), and HLADH stock (3 gL–1 ) were freshly prepared in 50 mM Tris-HCl buffer at pH 8. The laccase was applied as delivered (0.2 mM solution). The mixture of meso-3- methyl-1,5-pentanediol stock (1 mL), acetosyringone stock (1 mL), NAD+ stock (0.2 mL) and buffer (6.7 mL) was incubated at 30 °C for 5 min. Finally, laccase (0.1 mL) and HLADH solution (1 mL) were added. The starting concentrations were: 50 mM meso-3-methyl-1,5-pentanediol, 0.5 mM NAD+ , 200 µM acetosyringone, 0.3 gL–1 HLADH and 2 µM laccase. The reaction mixture (10 mL) was orbitaly shaken at 600 rpm in 50 mL Falcon tubes at 30 °C. Samples (50 µL) were taken at defined time intervals and mixed with 200 µL EtOAc (containing 5 mM acetophenone). The mixture was vortexed and dried over anhydrous MgSO4. A conversion of 72 % to the enantiopure (S)-4-methyltetrahydro- 2H-pyran-2-one (ee > 99% according to GC analysis) was achieved after 16 hours. The reaction mixture (10 mL) was then saturated with NaCl and extracted with EtOAc (3 x 10 mL). After each extraction step the mixture was centrifuged (4000 rpm, 10 min). The collected clear organic phase was dried over anhydrous MgSO4 and the solvent was removed under reduced pressure to give a yellowish oily compound (39 mg). Purification of the crude product was attempted by column chromatography (Pasteur pipette filled with Silica gel 60, 70-230 mesh particle size; solvent petroleum ether: ethyl acetate 9:1). Fig. 3 Stereoselectivities of the new ApPDC-variants for the synthesis of (S)-PAC. The different variants were tested as wet cells, crude cell extracts, and purified enzymes. Reaction conditions: wet cells – 20 mM benzaldehyde; 200 mM pyruvate; 50 mM KPi-buffer (pH 6.5), 2.5 mM MgSO4; 0.1 mM ThDP; 20 °C; 800 rpm, 800 μL reaction volume in 1.5 mL closed glass vials, whole cell catalyst concentration of 50 mg mL−1. Crude cell extract – 20 mM benzaldehyde; 200 mM pyruvate; 50 mM KPi-buffer (pH 6.5), 2.5 mM MgSO4; 0.1 mM ThDP; 20 °C; 800 rpm, 500 μL reaction volume in a 96-well sheet; see ESI chapter 2.1.4–2.1.5† for the catalyst concentration. Purified enzyme – 40 mM benzaldehyde; 200 mM pyruvate; 50 mM KPi-buffer with three different pH values, 2.5 mM MgSO4; 0.1 mM ThDP; 22 °C; 800 rpm, 800 μL reaction volume in 1.5 mL closed glass vials; protein concentration of 1 mg mL−1. (S)-Phenylacetylcarbinol [(S)-PAC] and its derivatives are valuable intermediates for the synthesis of various active pharmaceutical ingredients (APIs), but their selective synthesis is challenging. As no highly selective enzymes or chemical catalysts were available, we used semi-rational enzyme engineering to tailor a potent biocatalyst to be >97% stereoselective for the synthesis of (S)-PAC. 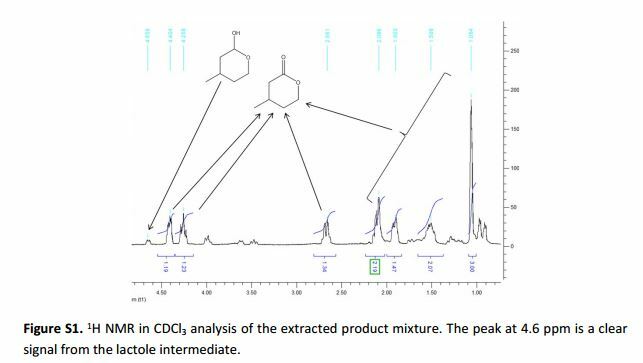 By optimizing the reaction and process used, industrially relevant product concentrations of >48 g L−1 (up to 320 mM) were achieved. In addition, the best enzyme variant gave access to a broad range of ring-substituted (S)-PAC derivatives with high stereoselectivity, especially for meta-substituted products.